ESL Made Easy: September Topic: Coffee! International Coffee Day is coming up this Tuesday! 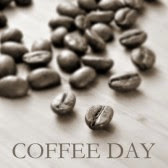 This day has been traditionally observed and celebrated on September 29th in many coffee loving countries. If you or any of your students are java lovers, then what could be more fun than learning about coffee, its origins, and all its economic and health benefits. International Coffee Day is a great day for helping to raise awareness for fair trade coffee and for all its coffee growers around the world. Learn more about fair trade coffee here. World-wide coffee vendors also look forward to this day and celebrate with giveaways and special deals for their loyal customers. Talking about International Coffee Day can make for a lively and stimulating class discussion (on any day, really) - especially for your coffee drinkers!